The GM Motorama was an elaborate auto show held eight times between 1949 and 1961. Those held consecutively from 1953 to 1956 are the ones best remembered because those shows featured dream cars typically built of fiberglass– such as the 1953 Buick Wildcat, 1954 Nomad, etc. These cars tested the public’s reaction to new ideas as well as familiarized them with advanced styling. 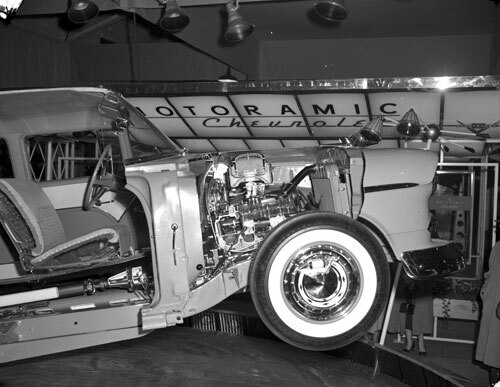 The traveling exhibition was held in major cities across the United States and it highlighted the many automobiles and other goods produced by GM. Of course Chevrolet was always a major part of these shows. 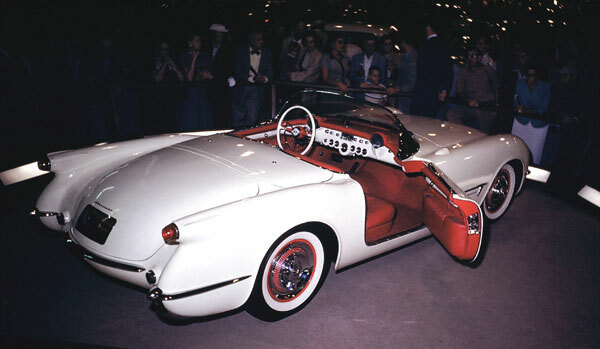 There was no GM auto show held for 1951 and 1952, but that changed for 1953 with the launch of the “GM Motorama.” Among the dream cars shown on the tour was the first Corvette prototype. It was scheduled to go into production for the 1954 model year, but public reaction to the fiberglass sports car motivated GM’s management to push production ahead resulting in a run of 300 of them being built as 1953 models. For 1954, GM offered 13 dream cars for viewing at their Motorama – the largest number ever shown at their traveling auto show. A trio of special Chevrolets was included – all of them Corvette-based show cars. These were the Nomad station wagon, Corvair, and a Corvette with a prototype detachable hardtop and roll-up windows. The latter was also equipped with an interior similar to that of the then forthcoming 1956 Corvette. 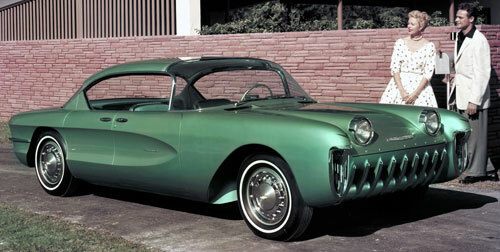 This car’s other special features were also adopted for ’56, though the detachable hardtop was an extra-cost item. 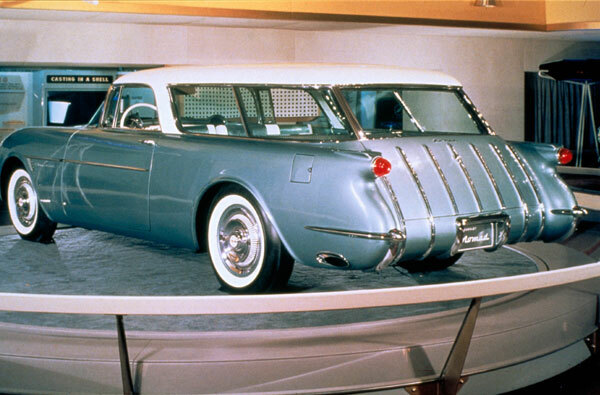 The Corvette-based Nomad appears to have been given a little serious consideration for production, but in the end its roof was adapted to the Bel Air and this version went into production for 1955. There is good evidence to support the author’s belief that at least two of the Nomads were built (though a complete documentation here would require a separate article). 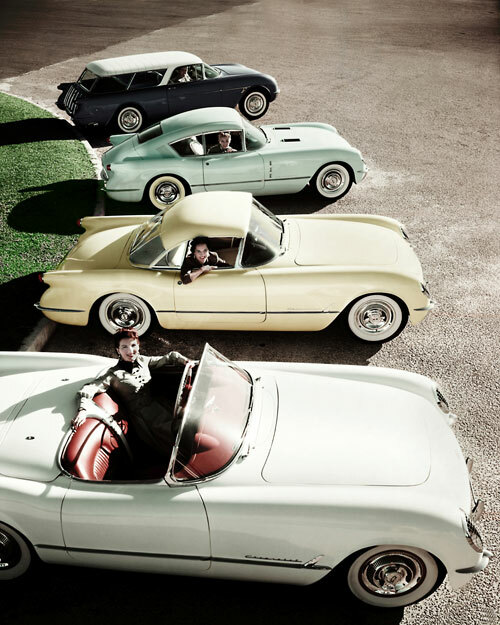 The 1955 model year brought a significant milestone to GM and important changes. General Motors’ 50-millionth production automobile, a Chevrolet Bel Air two-door hardtop, was assembled in November of 1954. The special car was painted Anniversary Gold and had a reported 716 trim parts plated with 24-carat gold. The car’s special interior was color-keyed to the exterior and had the 50-millionth commemorative medallion made for the event attached to each door panel. This one occupied a turntable during the GM Motorama tour. The Bel Air, as well as the rest of the big passenger car line, by the way, was freshly redesigned for ’55. Also new for 1955 was Chevrolet’s V8 small-block. This modern engine was prominently displayed as a cut-a-way exhibit at Motorama shows. Other special Chevrolets shown included a Bel Air four-door sedan painted Neptune Green and Polo White, which was cut lengthwise along its right side to reveal its inner components and a Bel Air four-door sedan with a see-through hood and air conditioning. 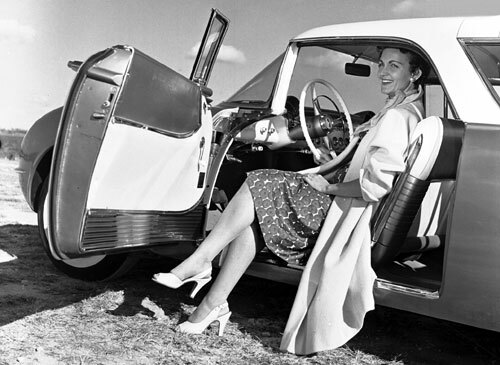 Air conditioning became an option for Chevrolets and it was fully integrated under the hood unlike the earlier units, which occupied a portion of the trunk. A plexiglass hood was made for the Bel Air display car to allow viewers to have a look at not only the air conditioning unit, but also the V8 engine– without interrupting the clean lines by having a raised steel hood. Also parked among these cars was a Polo White Corvette, finally equipped with a V8. Occupying a turntable was the new Bel Air-based Nomad two-door station wagon painted Cashmere Blue and Polo White. 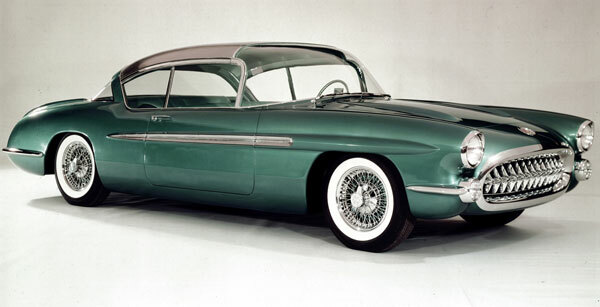 Also present was a dream car wearing the Chevrolet name – the Biscayne. This was a four-passenger, pillarless four-door hardtop featuring side coves and rear-hinged rear doors, a.k.a. 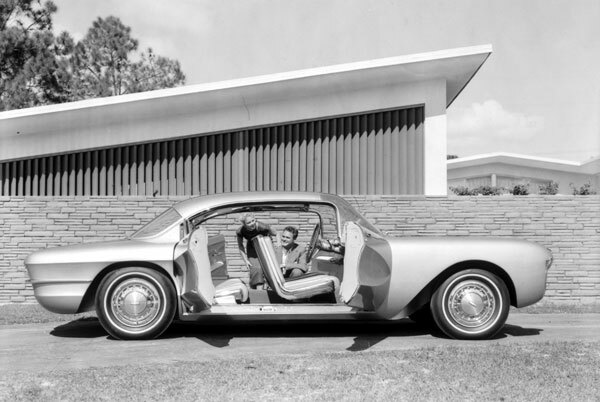 “suicide doors.” The side coves which wrapped around the back of the Biscayne would be seen on the following year’s Corvette, though reversed from that of the Biscayne. In an era when chrome was used to establish status, the elegant Biscayne’s comparatively minimal chrome trim must have been a surprise to many observers. The dream car’s frontal design may have been its most curious exterior feature, however, and it may have been inspired in part by the Kurtis sports car. Long fairings for the headlights each ended just ahead of an inlet that allowed cooling air into the interior. A so-called “Stratospheric” wraparound windshield curved upward into the roof– its upper portion was tinted to reduce glare from the sun. Its basic shape was adopted for the 1959-60 GM cars. The taillight shape and rear panel of the Biscayne was similar to what appeared on the 1961-62 Corvettes and later on the Corvette Sting Ray. Underneath the Biscayne’s hood resided a 215 horsepower version of the new Turbo-Fire V8 modified with a high-lift camshaft, dual exhausts, a four-barrel carburetor, and perhaps other upgrades to boost its output from the rating of 180 (specified for a stock version with the four-barrel carburetor). The Biscayne’s high-performance engine suggested to the public there would be higher performing V8s from Chevrolet in the future. Inside were thin-shell, swiveling front bucket seats separated with a small console that served as a storage area and armrest. All four seats were trimmed with chrome and covered in green leather matching the car’s “Atlantic Green” exterior color. The Biscayne, incidentally, is now fully-restored and a part of the Bortz Auto Collection. Even the Bel Air, which became the 50-millionth GM automobile, is reported to still exist. 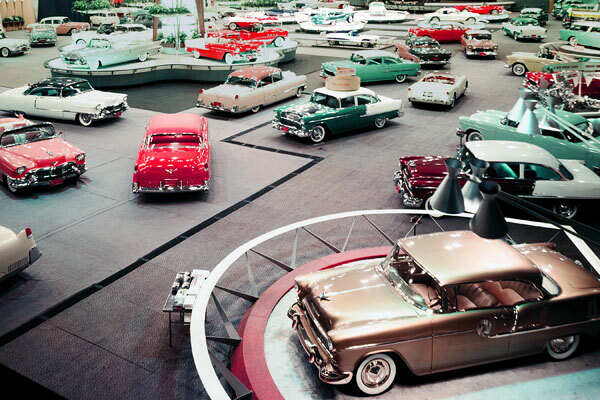 GM’s Motorama of 1956 would mark the end of dream cars from each passenger car division of the company. No one realized that at the time, but the 1957 tour was eventually canceled and there would be no other dream cars shown for the limited Motorama shows of 1959 and 1961, with the exception of the turbine-powered 1958 GM Firebird III. However, the fact should be noted that GM of Canada hosted a Motorama in Toronto and Montreal (and perhaps other cities) in consecutive years from 1955 to 1961. Their shows often had one-year old or even older dream cars on hand.